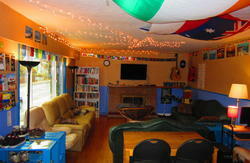 Newly renovated hostel for your comfort! We welcome all ages and all groups including singles. Travellers love our location because it is super convenient to the grocery store, restaurants, premium coffee shops, city town mall and even banks! 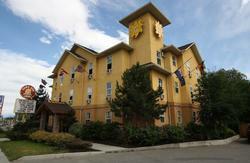 The ultimate location for staying in downtown Kelowna for an unbeatable price!! New opening special: all guests will enjoy 10% off for stays between Mon-Thurs on non-holidays until June 30, 2011 (check-out date). Please book directly with us for more details! 5 rooms to choose from: dormitory (womens and mens are separated), private singles, private doubles, private queens, and private triples (great for families). Complimentary breakfast included in your every stay! Self catering facilities in the kitchen are also available for use free of charge! Guests must present valid Passport or Drivers' License upon Check-in. Failure to present valid documents will result in denied check-in. A $ 20 key deposit is required from every guest and it will be refunded to you upon check-out. Cancellation Policy: 48 hours notice is required for all cancellations or the first night's accommodation will be charged. Taxes not included in the rates shown online. Head west on Trans-Canada Hwy/AB-1 W. Continue onto Trans-Canada Hwy/BC-1 W. Turn left at Vernon-Sicamous Hwy/BC-97A S. Continue onto Okanagan Hwy/BC-97 S. Continue straight to stay on Okanagan Hwy/BC-97 S. Turn right at Richter St. Turn right onto Bernard Ave. KBH will be located across from the First United Church. Head East on Trans Canada Highway/BC-1 E. Take 286 for BC-97C/BC-5A toward Merritt/Kelowna/BC-8. Turn left at Okanagan Connector/Princeton-Kamloops Hwy/BC-5 Alt S/BC-97C E (signs for Kelowna/Princeton/BC-5A S). Follow signs for BC-97 N/Westbank /Kelowna/Vernon and merge onto Okanagan Hwy/BC-97 N. Keep going straight past the bridge/ramp. Turn left onto Richter St. Turn right onto Bernard Ave. Kelowna Okanagan Lake Hostel will be located across from the First United Church. You can get a taxi for $10. Alternatively, you can get an airport express shuttle bus from the terminal.